The symbol of the Salt River Pima-Maricopa Community is the Man in Maze, an apt design for an Indian Community caught in the web of a burgeoning metropolitan pressures. The legend, which is taught to all Pima-Maricopa children, depicts the experiences which occur during the journey through the maze of life. While negative events happen, children are told that, ultimately, each person can discover a physical, mental, social and spiritual balance. At the center of the maze are one’s dreams and goals. When one reaches the center, the legend describes that each person is met by the Sun God who blesses and greets us and passes us on to the next world. Consisting of 52,600 acres, the Salt River Pima-Maricopa Indian Community is located 15 miles northeast of Phoenix. It is adjacent to Scottsdale, Tempe, Fountain Hills and Mesa. The Community is home to nearly 10,070 enrolled members who represent two pre-American Sovereign Indian tribes: the Pima (“Akimel Au-authm”-River People) and Maricopa (“Xalychidom Pipaash”-People who live toward the water). Although the two tribes speak different languages, they share cultural values. 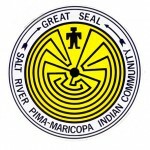 Created by Executive Order June 14, 1879, the Salt River Pima-Maricopa Indian Community has dedicated its resources to finding its way to successfully through the maze of urban pressures. Out of respect for their land, the Community maintains 19,000 of its acres as natural preserve. The secondary land use is agriculture which supports a variety of crops including cotton, melons, potatoes, brown onions and carrots. Commercial land use is largely restricted to the Pima corridor, a linear stretch bounded by Pima Road, the border between the Community and fast-growing Scottsdale. Within this commercial corridor, the Community has leased its property for development of the Pavilions, a 140-acre retail power center, thought to be the largest retail commercial development ever built on Indian lands. Anchor tenants include Target, Home Depot, Ross Dress for Less, Service Merchandise, Best Buy, etc. A Wal-Mart Retail Center is also located within the Community land. In addition to these ventures, the Salt River Community operates a landfill which has received national awards for design and environmental excellence. Historically, the Pima, are descendants of the Hohokam (Hoo-hoogam), people who farmed the Salt River Valley and created an elaborate canal irrigation system centuries ago. In contrast, the Maricopa originally lived along the lower Gila and Colorado Rivers and migrated toward Pima villages in 1825. Visitors are invited to the Salt River Pima-Maricopa Indian Community’s Hoo-Hoogam Ki Museum where baskets, pottery and artifacts from many tribes are displayed. The museum structure is constructed of adobe and desert plants and utilizes architectural techniques from several tribes. Although no restrictions are posted against visitors driving through Salt River Community, tourism opportunities are limited to visiting the museum, except for special events such as an annual open house. The Pavilions shopping center offers complete entertainment facilities including: Movie theaters, restaurants, family entertainment centers and shops. Casino Arizona is one of several enterprises owned and operated by the Salt River Pima-Maricopa Indian Community. There are two Casino Arizona locations neighboring the city of Scottsdale. Casino Arizona at McKellips, located on the 101 & McKellips Rd., features 500 slot machines, 50 poker tables, a state-of-the-art 540-seat bingo hall, a 40-seat Live Keno Play room, a high stakes poker room, Players 21 pit, 30-seat Racebook/Off-Track Betting Room, as well as dining and entertainment. Casino Arizona at Indian Bend, located on the 101 & Indian Bend next to Scottsdale’s Pavilions Shopping Center and Talking Stick Golf Course, features 200 slot machines and dining.